Pure white soap-no colors added. 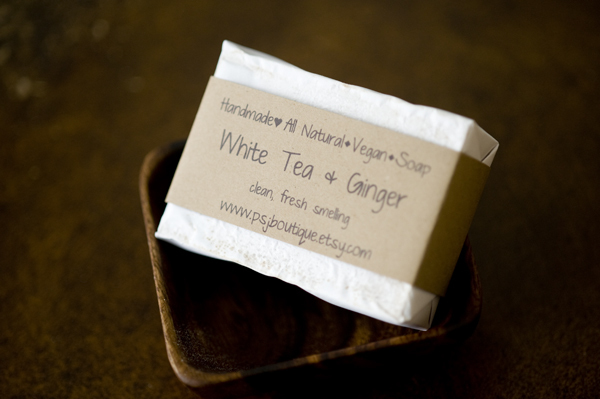 Natural vegan glycerin handmade soap, lightly scented -white tea & ginger. Moisturize as you bathe, since my soaps do not contain detergents they are designed to keep your skin moisturized and do not strip your skin of essential oils. This alluring rich lather soap is detergent free made with all natural ingredients. Lots of lather all naturally without the detergent. Gentle to your skin & the environment made to pamper your skin. These handmade soaps are great as gifts, for use in the guest bedroom, or personal luxury. Soap bar dimensions: 1 inch thick – approximately 5+oz. All transactions securely through PayPal, no account needed to use PayPal. Note: Soaps will last longer if kept dry between uses. Use a draining soap dish and keep it away from direct water. 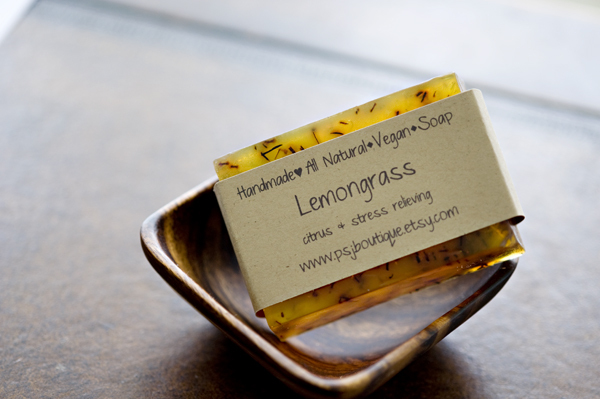 Natural lemongrass soap. This alluring rich lather soap is detergent free made with all natural ingredients. This is a glycerin soap bar. Glycerin is a humectant, meaning it attracts moisture to your skin. A superior quality product with natural ingredients. Lots of lather all naturally without the detergent. An awesome relaxing smelling soap!! Size: 2 3/4″ x 2 3/4″ x 1 1/4″ (thick) – 6oz. Wrapped in acid & lignin free paper.